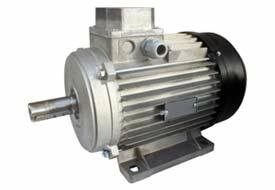 Electric motors are about as common in U.S. industry and commercial buildings as roast turkey at Thanksgiving. According to the Energy Information Administration, about one-half of all electricity used by U.S. industry goes to power motors. While electric motors will be far from most Americans' minds this Thursday, it’s worth taking a moment now to be thankful for the feast of energy and dollar savings provided by the strong new motor efficiency standards proposed by U.S. DOE today . According to today’s proposal, new motors meeting the proposed standards purchased over the next 30 years will save businesses about 1 trillion kilowatt hour and $23 billion. (The U.S. as a whole uses about 4 trillion kWh per year.) Those savings go right to the bottom line, making U.S. industry more competitive. Those electricity savings translate to millions of fewer tons of power sector emissions. DOE based the proposed standards on a joint recommendation filed with them by manufacturers and efficiency advocates, including ASAP and ACEEE, in August 2012. Two years in the making, the recommendation took an innovative approach: rather than trying to set slightly higher standards for electric motors already covered by two rounds of previous U.S. standards, we recommended that DOE expand the scope of coverage to many motor types not previously regulated. This approach made sense for both energy savings and for motor manufacturers. For energy savings, establishing standards for unregulated motors would save 3 to 5%, whereas improved standards for already regulated motors would not have packed such an economic punch. With our approach, manufacturers could apply the proven designs they were using in existing regulated motors to additional motor types. The motors proposal marks another key milestone for DOE Secretary Ernest Moniz’ efforts to catch up on the backlog of overdue standards. DOE has completed four other proposals since August, covering commercial refrigeration, furnace fans, and metal halide light fixtures. The final new motors standards should be completed during the first part of 2014. Strong new energy saving standards for all of these products completed in 2014 will be more cause for celebration. EDITOR'S NOTE: An earlier version of this blog post listed the wrong reason for why motors used in residential projects are not covered by this standard. We attributed it to the 1 hp cutoff. Commenter "yetanothergeekguy" pointed out that many homes have 1 hp or greater motors for furnace and a/c fans and pumps. He's right. The reason residential motors are not covered, though, is because the new standards cover only polyphase motors.